contacted Brad with my request and he took care of me with prompt service by a qualified, professional and polite employee. Thank you so much for the positive review Paul. Big or small we take pride in serving all clients to the best of our ability. Thanks again and please keep us in mind for any future referrals!!!! Our "old" roof which was under 10 years old, was previously installed incorrectly and therefore needed replacing prematurely (we were having leaking issues.) Coast Mountain was great; they returned my inquiry about an estimate within hours and had someone out to quote the job within a week. In days I had a meeting with a senior roofer and had a professionally bound booklet with varying options and tangible products in my hands. The installation of the roof came a few weeks later; the guys were fantastic- they were efficient, professional,tidy, and had safety measures were in place (harnesses). Now with all the rain we've had in the last few weeks I can say there's been no issues with our new roof! Thank you for the kind review!! 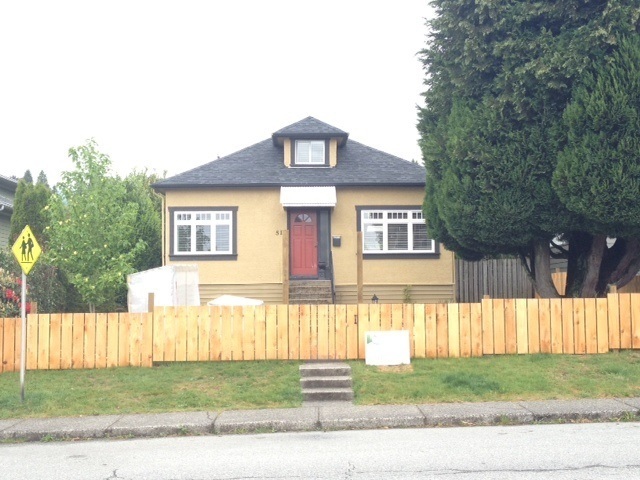 You can now rest assured with a professional installation that your family will be dry in the lovely Vancouver winter weather!!! Outstanding owner and crew. Brad did a great job of keeping me up to speed on when the weather would allow the job. Once started his team was amazing, great onsite communication, lots of forward thinking, first rate clean up and a very safety oriented worksite. Noel what a pleasure to work with you also. We also had a great experience and it brings great satisfaction to the team at Coast Mountain to have another happy customer. We look forward to future endeavours with you. 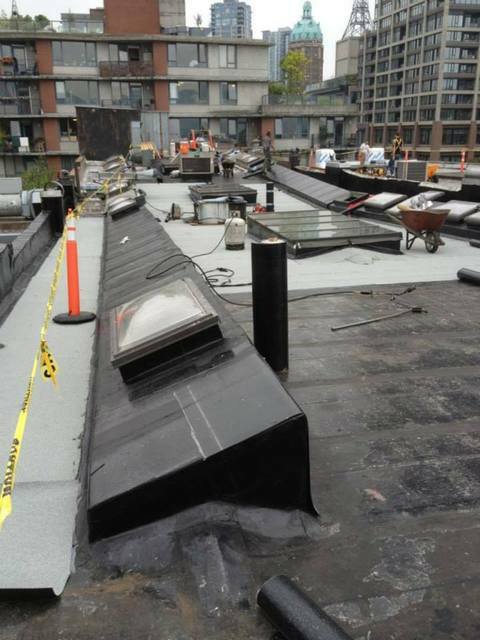 Brad and his crew recently replaced the flat roof on our mixed residential/commercial strata. I was the strata roofing project liaison. All of his crew were very friendly and they were always available when needed via text or phone - this availability was appreciated and crucial in getting the work done in a timely manner. They answered all of our questions and got the work done on time and within the quoted amount. I would be pleased to work with them again. Thank you for the positive review. Its always nice to complete such a large and technical strata corp roofing project and have all people involved so pleased from start to finish. We look forward to working with the group and property management in the future. See you soon for your first annual inspection and maintenance! Brad came to the house, explained in detail the process, choices of materials etc. He left all information and a copy of estimate and called back when I was ready. The crew did a good job, from the removal of the existing shakes, applying the new roof and clean up. Diana thank you so much for the opportunity to work with you. Although it was the first time in almost 2 decades in the roofing industry, it was personally my first time seeing TWO LAYERS OF CEDAR ON A SINGLE ROOF!!! However our skilled crew was able to handle it with no issue at all. Everything was completed under the proposed timeline and you are happy with the end result, a beautiful new roof to keep you dry for many years to come. 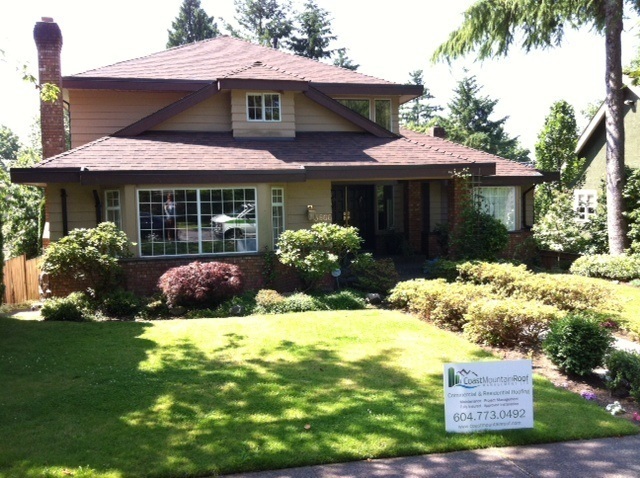 We hired Coast Mountain Roof Ltd to install a new roof on our home last year. We are very pleased ... and dry! We are also very pleased with the follow up inspection & maintenance they recently conducted. Andy identified an area that could use a roof trough to redirect rain better and Hugh was back shortly after to install it. 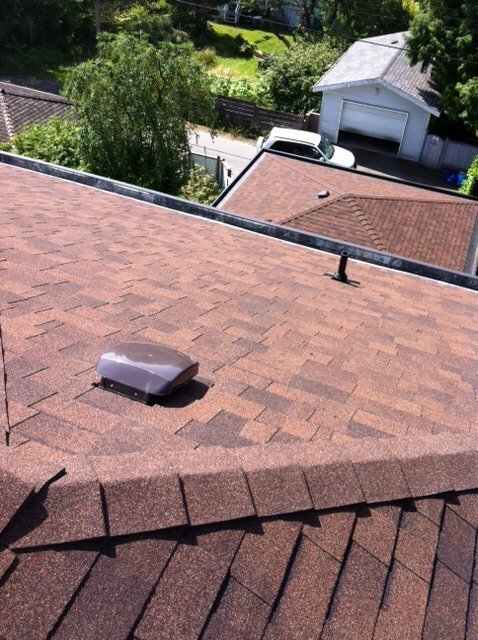 We have recommended Coast Mountain Roof to others and trust they will be pleased too. Great to hear that after your first winter under a COAST MOUNTAIN ROOF! Your family is dry and your investment protected. 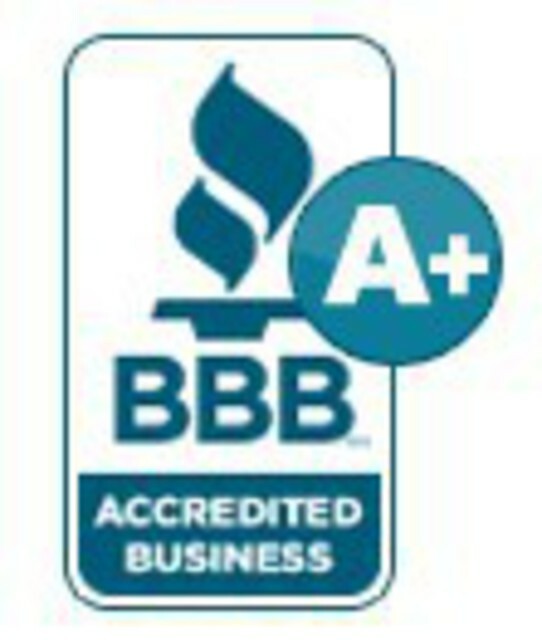 We have received your referrals and would like to express our extreme gratitude for that. Thank you again for your patronage and we look forward to speaking with you in the future upon your next round of maintenance!! I appreciated Brad sitting down with me and explaining the quote in detail. The workmanship was top notch, and my new roof has weathered the worst windstorm in ten years! Thank you, Coast Mountain Roofing! Thank you so much for the review. We will be here to ensure that your new roof and EPDM gutters stand the test of time. We will see you soon for your annual check-up. Working with Brad through the estimate process was very clear and professional and gave us the confidence to chose Coast Mountain Roofing. His team were punctual, worked very hard and had the roof finished in two days. Great guys...thanks Brad! Martina & Brent it was an absolute pleasure to deal with you both and many positives have and will continue to come out of this relationship. We are excited to join you in the Landmark Forum in September and look forward to your many referrals that im sure will follow!! 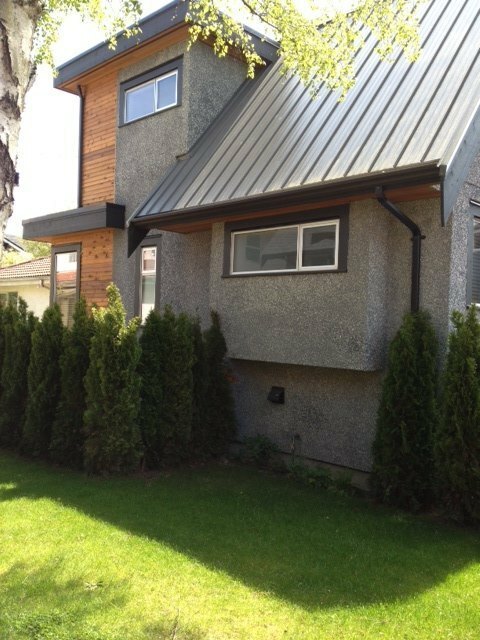 We had a great experience with Coast Mountain Roof Ltd. Great job on the roof. Help picking out colour and product. Great crew. All friendly and knowledgeable. Nice job on the clean up. No issues. Thank you so much for the great testimonial. It always our goal to put clients into the products that will suit them best for the configuration of their home and geographical location. The Malarkey Legacy was a great choice. Thank you kindly for your business and we will see you in the fall to clear all the debris that those large trees overhead are sure to leave. this is a company of the old school variety,they take pride in their work,their prices are competitive,and they deliver the goods. my neighbour and my brother ,on my recomendation,have both employed coast with the same great results. thanks again brad and crew . Thank you for the review and many referrals that you have given us Peter. We look forward to seeing you this fall for another round of preventative maintenance!